Mimi Thorisson is the author of A Kitchen in France, and Manger, her blog devoted to French cooking and life in the French countryside. Though she grew up in Hong Kong, Mimi developed a love of French cooking early on while visiting her grandmother in the South of France. She is the host of the French cooking shows La Table de Mimi and Les Desserts de Mimi. She lives with her photographer husband, their seven children, and a band of smooth fox terriers in an old château in St. Yzans, in the Médoc region of France. Jessie Kanelos Weiner is an illustrator, food stylist, and author best known for her vibrant watercolor illustrations and fine line coloring books. Jessie writes and illustrates a blog about her life called thefrancofly.com. She has written a handful of cookbooks, including a collection of American family recipes adapted to French tastes Pâtisseries et gâteaux d'Amérique. 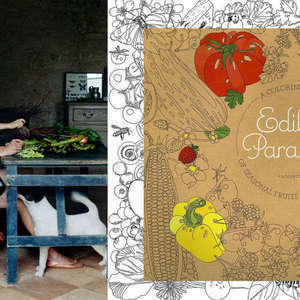 Her latest book, Edible Paradise: A Coloring Book of Seasonal Fruits and Vegetables, explores the edible plant kingdom. A Chicago native, Jessie currently lives and works in Paris.